Randi Russo, you is awesome! Hello and welcome to 2009! Wow. Soon we’ll be out of the ’00s and into the ’10s. She writes, sings, plays a mean guitar, and wields a powerful paintbrush. You might even call her a female Joseph Arthur. Read on, and see for yourself. And while you can hear some tracks off Randi’s MySpace, wiggle on over to I LOVE Your Clothes for more on this hypnotic artist. Randi Russo: I have to say that there really aren’t any curse words I find offensive …unless they’re overused within a sentence or said with the intent of hurling a personal insult. All curse words can be used playfully or even in the most pedestrian ways. YIA: Do you prefer, for yourself, dreads or your normal hair? RR: Hmm, I guess normal hair. I still like the look of dreads… I just think they look better on others. At least I’ve done it once, so if I die, I’ll have a better chance of meeting Jah. YIA: Do you prefer, on others, dreads or their normal hair? RR: Mostly prefer normal hair on others. Dreads look great on some people though. I’m not much of a “salon-dread” lover — I don’t like them when they look too polished and sleek. 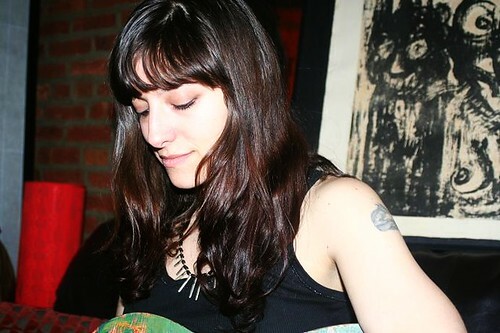 YIA: Is being a “guitar goddess” a heavy burden? RR: Ha! Yeah, only because when you’re called one in the press and you don’t live up to it, you got a lot of explaining to do — and not with words but performance …and I don’t always hit the mark. I guess you gotta own something like that when someone says that about you. It’s a heavier burden when you don’t own it. YIA: We know what happens when you flip a righty guitar and play southpaw: awesome songs. What do you think happens when you play a lefty guitar as a righty? RR: Well, I’ve tried it and it’s not so good! I guess clipping my fingernails on my left-hand would help matters though. YIA: So music is dancing on your paintings. Have you ever considered dancing on your music with paint? RR: That reminds me of what someone posted on my MySpace page in response to my quote. He wrote something to the effect of, “I hear paintings dancing inside your music.” I wish I came up with that. And now you’ve even taken it a step further… now dancing on music with paint! Are we out of permutations at this point? …because I think you just blew my mind. YIA: What’s more cathartic: writing a song, or painting a…painting? RR: Painting a song is best but doesn’t happen as often these days. Seriously though, it just depends on the day, the mood, etc. If I think the painting or the song is coming out good, it charges me up. Music’s cathartic effect is much more immediate. Painting’s cathartic effect is slower but much more longer-lasting. If I play a song live or hear the recording of a song hundreds of times, it loses that punch that it gave me when I first wrote it. Yet, when I look at an old painting, I can still get some kind of joy and release from it years later. YIA: What’s the way to a boy’s heart? RR: Oh goodness… you shouldn’t come to me for relationship advice! After all, I’d probably say something boring like, “Be yourself” (which, by the way, is what I’d say). YIA: How is touring the UK/Europe better (or worse!) than touring the US? RR: Better. The audiences are better… much more appreciative, nicer, attentive, enthusiastic. For the most part, I just feel a higher level of respect over there. RR: That’s funny… as you know, anti-folk isn’t against folk music but is folk music that, at its best, cuts the head off of the hydra of mediocrity. Unfortunately, those heads keep growing back! As far as what I’m against, well, there are too many to list. To sum up it all up neatly with a word, I’d say I’m anti-dishonesty, whether that involves realms that are political or personal. ~ by youisawesome on January 1, 2009.